Then I can add my follower next turn and score lots of points. Of course, then another player may claim the row and score those points... So, what is the answer, add to the row or maybe claim it now. Oh, what a dilemma. 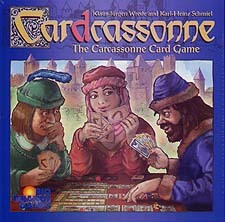 In Cardcassonne the players place their cards in rows so as to make each card a valuable as possible. Carcassonne - now fun with cards!